This Old Campsite was created by Brad and Jane Fuller. I was an Airline Pilot for 34 years and a pilot in the Navy for 5 years before joining the ranks in the airline industry. My wife was mostly a stay at home mom until our children were older and then she went into the school system where she worked for 15 years. We started camping in August of 2002 when we bought our first camper, a 36 foot Everest 5th wheel. Most people don't start with a large camper at first, but we had been giving this camping thing consideration for several years and decided to buy what we wanted on the first go around and not be faced with coming back for a larger camper later if we enjoyed the camping experience. Well, we enjoy the camping life and plan on doing it as long as we can. Our website is dedicated to providing an objective view of campgrounds that we have visited and hopefully that of other campers who provide information to this site. After we started our camping experience, we found that the information provided in camping books only gave written discriptions of campgrounds. Sometimes we would pull into a campground and find that it was nowhere close to the description in the book. We will try to provide candid pictures of the campgrounds so that you will be able to get a better idea of whether or not the campground meets your criteria. 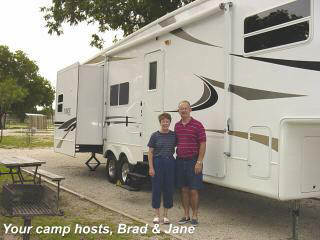 A large number of campgrounds today have their own websites. However, in my opinion, the websites can distort the quality of the campground by taking just the right picture. As well as providing campground recommendations, This Old Campsite will provide other information related to the total camping experience. We will have articles relating to campers and camping, articles on pets, jokes on the humor page, technical tips related to campers, free recipes that can be prepared in the camper or home, free classified ads, and any other information that we feel relates to campers and camping. We hope that many of our readers will take the opportunity to send in articles, tips, pet pictures, recipes or just general comments about this site. There is a Blog included where you can leave comments if you have something to say. We hope that you will enjoy the site as much as we enjoy constructing the site.